There are buses from Leh to Spituk (7km) every 30 minutes, or for Stok (14km) at 1pm, 4pm and 4.30pm. Alternatively you could get a taxi for the short journey; Rs181 to Spituk Bridge or Rs380 to Stok. One or two buses a week go as far as Jingchan via Spituk Bridge but it is much better to walk this first day than spend it on the bus. Bring all your supplies from Leh as you won't find much in these villages. Buses from Stok to Leh depart Stok at 8am, 8.30am and 2pm. There are frequent buses from Spituk. For information on this alternative start to the Markha Valley trek see ‘Stok to Spituk via the Stok La’ p189. Spituk is the site of the first Gelukpa gompa in Ladakh which is well worth a visit if you have the time, particularly for its commanding views over the Indus Valley. Pass through the village and carry on along the bumpy road to the bridge across the Indus. There are some flat pastures here where it is possible to camp and this area is often used by the pony-men as they await their next group of trekkers. An early start to this stage is important as it can get very hot crossing the plain between here and the Jing-chan Gorge. Take plenty of water as it may be over three hours before you can refill. Across the bridge, trekkers are usually stopped by the national park staff where they are asked to sign the register and pay a Rs20 per day park fee (students Rs1 per day). Follow the jeep track south from the bridge for 300m and then west (R) to a small village with two impressive houses. You leave all vegetation behind as you begin crossing a flat and desolate plain at the foot of the Stok Mountains. You may witness the impressive skill of Indian Airlines pilots guiding their planes between the mountains as they come down to land at Leh airport; it's reassuring to have your feet firmly on the ground. This may not be your idea of a Himalayan wilderness experience with the busy Leh-Srinagar road on the north bank of the Indus but you will soon be leaving all signs of the 21st century far behind. After 11/2km across this plain the path splits. The jeep track stays on the higher ground while a pony track cuts a more direct route across the plain. The latter is slightly shorter but crosses a number of small, dry ravines which the jeep track avoids. The path swings to the south-west following the Indus into a narrower valley. You soon reach a chorten and prayer flags (Map 2); from here you get impressive views down the Indus Gorge. This stretch of river is popular for rafting and it's exciting to watch the rafts shoot the rapids below from the safety of dry land. Leave the Indus behind and head into the mountains along the pretty, willow-lined Jingchan Gorge, following the jeep track and then the obvious trail into Jingchan. There are two campsites here, one just before the village and a more secluded one just after. These get filthy in the main trekking season and trekkers are totally responsible for this. A toilet has been built, so please use it. Do not bury, burn or leave any rubbish – pack it all out with you and dispose of it properly in Leh. It is unacceptable for trekkers to vandalize a beautiful area where people live and work. Please tread lightly on your trek and encourage everyone else to do likewise. If you're planning to go up to the Ganda La base camp next day it would be wiser to push on to Rumbak. 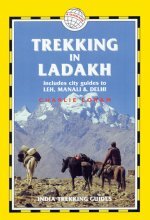 it's at a much better height for acclimatizing as it's 300m higher than Leh (3500m/11,480ft) to which you should already be acclimatized. This is far more sensible than sleeping at Jingchan (3380m/11,090ft), 120m lower. However, you may need to be particularly persuasive to get your pony-man to go on to Rumbak the first day, as Jingchan is the usual stop. The route is straightforward as you simply follow the Jingchan Nala upstream. Down by the river is a small hut, the official entry point to Hemis National Park. If anyone is in residence you will be asked to pay an entry fee (Rs20 per person per day within the national park, reduced to Rs1 if you are a student) if you have not already done so at Spituk Bridge. Please ask how this money is being spent. Does any of it go to the villagers or to clean up the filthy campsites? The valley soon narrows and you pass between two rock buttresses. There is a choice of two paths. it's easier and drier to take the trail which rises away from the stream to the right (W). Horses usually take the trail which stays close to the stream. Look out for small herds of bharal (blue sheep) clinging to the impossibly steep sides of the gorge. They can be hard to spot as their colouring merges with the rock. After about 11/2km there are lovely views ahead to a spectacular jagged ridge. The stream forces the path closer and closer to the right (W) side of the valley until you reach a bridge across the torrent. There is an easy stream crossing ten minutes later. When the valley splits at a walled willow plantation, take the right fork (SW). The trail carries on up this narrow gorge for 21/2km until the valley widens revealing the snow-topped peaks of the Stok Mountains. At Rumbak is a sign that declares Rumbak to be the ‘Snow Leopard capital of the world’. Do not get too excited since, although this is certainly snow leopard territory, your chances of seeing one of these rare creatures are almost nil. Prayer flags on a wide pasture mark the junction with the trail leading east (L) to the main part of Rumbak village and to the Stok La (see p189 for a continuation of this route). You can see the pass to the right of the toothy skyline ridge. This pasture makes a good campsite and there are other options a little further up the main valley. There is a ‘parachute’ or tea tent at the pasture, set up by the Leh Nutrition Project and run by women from Rumbak village. They have an environmentally friendly approach, using pressure-boiled water instead of bottled water and disposing of litter in a responsible way. It is well worth supporting these tents as the money they generate is returned to the local communities themselves. You should consider leaving Rumbak only if you're having no problems with the altitude: it's a further 500m up to the Ganda La base camp and 1000m up to the pass. Continue walking upstream to a disused water-mill and bridge. Cross the bridge and continue upstream until the valley forks. Take the right (SW) fork and follow the path as it cuts up the valley's right (N) side. This is little more than a large house. You can fill up with clear spring water from a pipe below the main building. Just past the village the valley is split by a beautiful purple band of rock. Take the right branch, past a mani wall and cairn. There are a number of places where you could camp in this valley but the stream flows intermittently so it's worth going on to the top camp where there's a spring and, in season, a tea tent. From Yurutse, follow the stream up the obvious left (W) valley and not the smaller valley on the right going off to the north-west. The camp is 200m on after passing a blue and purple scree slope, before the valley divides again. There are great views back to the Stok La. If you've come all the way from Jing-chan you may well be feeling the effects of altitude as you are 1000m higher. If in doubt about your condition descend to Rumbak. Climb the spur above the camp, leaving dry beds on your left and right. You are aiming for the left (SW) valley but want to keep above and to the right of the small stream before crossing to the left. A clear path soon appears which takes you west towards the Ganda La. Stok Kangri dominates the south-eastern skyline as you climb. You may see yak, brought up here so that the grazing close to the villages has a chance to grow during the short summer. From the pass you can see the Zanskar Range to the west, while there are views to the Stok Mountains and beyond to the east. If you want better views climb either of the ridges by the pass. The fields of Shingo can also be seen far down in the valley. This is where you are aiming for. Route finding is simple enough from here; you cannot go far wrong if you just head downhill. Keep an eye out for marmots as you descend from the pass as they thrive in desolate, high-altitude spots. Remarkably unconcerned about humans, they will often just sit watching you pass. If you approach too close they give a shrill whistle of alarm and dive into their burrows. The trail down to Shingo is straightforward, passing several possible campsites. The highest camp is an ideal base camp for the pass. Notice the solar panel on the roof of the main house. Common in even quite remote villages, these can provide power for simple needs. The next stage takes you through a spectacular gorge with beautifully coloured and eroded rocks. Follow the intertwining streams below the hamlet, crossing and recrossing downstream through the willow grove. There is no path; follow the hoof prints and horse manure. Eventually the trail becomes established on the left (S) bank. You continue down the gorge for 21/4-3 hours, crossing the stream on stepping stones several times. The bottom of the gorge is thick with willows and sea buckthorn, which provides convenient shade from the fierce sun. Water is never a problem as the stream is always close. About 11/2km before the end of the gorge the stream disappears underground leaving just a dry bed. As you enter the tiny village the towering rock-faces ahead of you are awe-inspiring. There is an attractive gompa on top of the cliff on the right (W) while perched on a vertical rock wall above the village are the remains of a 1000-year-old royal residence. Turn east (L) upstream and the pretty campsite is 400m ahead among the trees. A smaller campsite lies by the tea tent near the bridge. You can make a day trip downstream to the Zanskar Gorge, passing many apricot trees and the village of Kaya. The round trip takes four to five hours. The trail to Markha is not too strenuous, rising about 300m over 22km. Being at a relatively low altitude it gets very hot in the sun. Skiu sprawls along the right (N) bank of the Markha for about 11/2km and then you start walking through thorny scrub. There are a few clearings here where it's possible to pitch one or two tents but the only source of water is from the silty river. After about 9km on the right bank cross a solid wooden bridge high above the water onto the left (S). The trail goes 100m or so through the scrub and then climbs away from the valley bottom to traverse a steep slope prone to landslides. Descend to a grassy patch which could make a good camp. The stream running through the grass is your best source of water for a while. After passing this hamlet keep your eyes open as the path veers off to the right (SW) cutting through some crumbly cliffs and climbing steeply upwards. Cross the river again at Tunespa (Thinlespa; Map 7), a village with very basic dwellings but well-kept fields. At the top of the rise out of the village you reach a collection of large chortens and mani walls. There are wonderful views back down the valley. Approaching Markha you get the first glimpse of the snow-covered slopes of Kang Yaze/Nimaling (6400m/21,000ft). This magnificent mountain commands the view for the next two days. There is a wolf trap on the outskirts of the village which may have a carcass at the bottom as bait. The wolf runs up the ramp into the trap and because the sides are sloping slightly inwards it cannot escape. It is then stoned to death by the villagers so that no single person has to bear the responsibility of taking its life; an important consideration in this strongly Buddhist region. During the summer wolves are not a problem but as food supplies dwindle during winter they occasionally come down to the villages in search of livestock. Keep to the trail by the river; after about 500m you will have to ford it. The current can be quite strong so if possible cross with others. Carry on up the left (SW) bank to a level grassy spot among some trees. it's possible to camp here or beneath the main farmhouse 500m further on. This is a lovely campsite but finding clear water is a problem and you will probably have to make do with silty water from the main river. don't pollute the river with soap as a channel from it takes water to the houses. Cross the river on the bridge (Map 8) by the campsite and follow the path as it climbs up to the main part of Markha village. The remains of a fort lie up to the right. To visit the gompa take the path on the left. Otherwise carry on through the village and fields. The path keeps close to the river until reaching a wooden bridge crossing the river. Do not cross the bridge but continue up the short slope through the bushes. The trail soon splits, the left (E) fork climbs and then traverses a steep cliff face while the right (S) fork heads down to the river. Unless the river is particularly high it's safer to take the right fork and ford it rather than risk the precipitous cliff path. This path is usable but badly eroded; a careless step could be fatal. If you cross the river, carry on up the left bank, passing a valley on your right (SW). A large rock spire marks the entrance to this valley. This is the beginning of the Jumlam, an extremely demanding route into Zanskar (see p40). Progress on this side of the river is soon stopped by a rock wall and you are forced to ford the river again. Despite the double river crossing, this route is still safer than the cliff path unless the water is very high. Umlung Gompa (Dinlung/Humlung/ Omlung/Omung). Feeling cool and re-freshed after the river crossings, you may have the energy to climb to the gompa high up on the left. After slogging to the top consider the poor monks who had to build the monastery and those here today who have to go down and up this path just to collect water. The views are not that spectacular but you get a great sense of height as you stand far above the valley bottom. The monastery is often closed during the summer as the monks have to go back to their villages to help with the harvest. Unfortunately, the only way to find out is to climb to the top! Approaching the village, keep the fields on your right. it's a wonderful level walk from here to Hankar with the towering peak of Kang Yaze standing over the valley. There's a good campsite just beyond the fields. The trail then takes a sharp left turn and climbs steeply to a group of chortens and mani walls. Up on the right, the ruined outline of Hankar Gompa merges beautifully with the rocky ridge on which it sits. The trail then crosses a stream and winds through fields before reaching a river. don't cross this. The trail divides here. 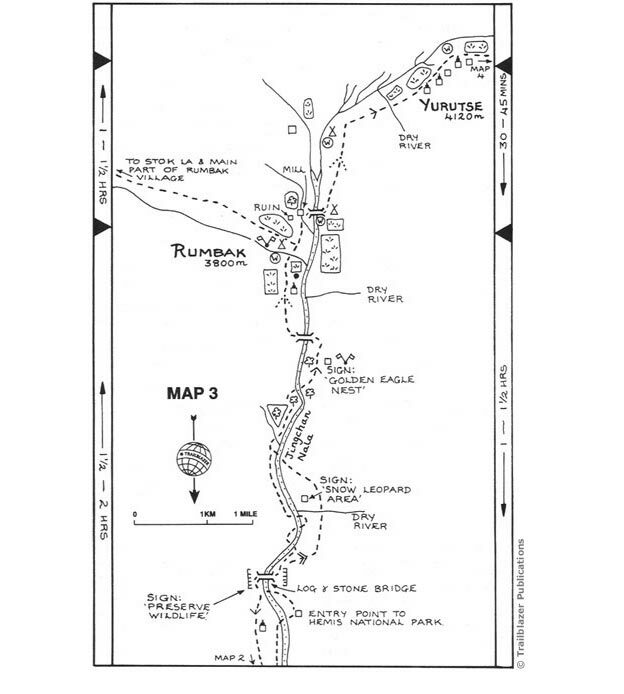 If you crossed the river and followed the valley straight ahead you'd eventually end up in Pang on the Leh-Manali road (see Across Karnak, p213). Instead, you want to follow the trail to Nimaling which heads up the right (N) bank of the Nimaling Chu through a gateway formed by large rock buttresses. A little further on there are some fascinating geological creations of large boulders balanced precariously on top of consolidated earth spikes. The trail drops to a bridge; cross and continue up the other bank. In 300m you reach the walled pastures of Tahungste/ Chachutse/Tchatchutse/Thachungtse, a lovely valley to camp in; you can cool off from the day's trek in the icy stream. A popular watering spot for bharal, it's a magnificent sight to see a herd slide and bound down the steep cliffs with incredible agility. The trail continues to climb above Tahungste and soon starts heading off to the south-east, away from the main valley. Note the beautifully eroded rock spikes down to the left (N). Follow a small stream until it starts veering around to the south. The trail then leaves it and zigzags back on itself as it gains height. It can be easy to miss the path down to the stream and continue on a path straight ahead. You pass several mani walls before reaching a small mountain tarn where, in summer, there is a tea tent for refreshments. There are wonderful views both of Kang Yaze, whose bulk gets reflected in the still waters of the lake, and also of the Markha Valley which you are now well above. There is a path from the lake to Kang Yaze base camp. This peak is a popular mountaineering objective and is usually climbed by way of the north-west ridge. While the climb to the lower secondary summit is not considered particularly difficult, reaching the main summit is far more demanding. If you are going on to Nimaling, keep the mountain on your right all the time. The trail rises gently past lots of mani walls and then descends slowly to the high-altitude valley of Nimaling. This large flat-bottomed valley has a semi-permanent population of villagers who come up from the Markha Valley to graze their livestock on the summer pastures. It is a beautiful and remote place to camp and one could easily spend a day or two relaxing or exploring the surrounding ridges and valleys. However, you should be warned that the weather can change rapidly at this altitude and you must come prepared for snow, even in summer. There is a tea tent here in summer. it's possible to continue up the Nimaling Valley to cross two passes to the south-east which will bring you down onto the Leh-Manali road just north of Rumtse near the village of Lato. This pass lies on the east side of the valley opposite Kang Yaze. There's usually a simple bridge across the Nimaling Chu which is replaced annually by the shepherds. However, it sometimes gets washed away by floods so if you can't find it you'll have to ford the icy stream. The trail climbs steeply from behind a small group of shepherds’ huts. The gradient soon eases but the trail becomes a bit indistinct. Carry on eastwards. Soon a saddle in the ridge ahead comes into view; this is the Gongmaru La. If there isn't any snow you should be able to make out a path meandering up the slope. As you climb the last short but steep slope to the top there are good views over the Zanskar Range and of the vertical ice walls on the north face of Kang Yaze. Until Chogdo the descent is particularly difficult for pack animals and very tiring for humans! It starts by descending steeply from the pass for 300m and becomes more gentle only at the very end. Just above a ruin there are some small, flat terraces with camping space for about five tents. There's a similar camping spot just after crossing the stream. Collect water here because the stream gets more and more discoloured the further down you go. The camping spot mentioned above would make a good base camp for the pass. Route finding is easy now as you follow this tributary until it meets the Shang River, and then you follow that downstream to the Indus. The trail follows the stream as best it can, sometimes on the stream bed itself and sometimes clinging to the steep valley sides. It changes from season to season so you'll have to use your initiative to find the best route. Frequent stream crossings are inevitable but it's often possible to keep your feet dry by jumping across the narrower sections; the boulders are slippery, so some kind of stick will make this much easier. The trail first descends into a pink rock valley which narrows into a mini canyon. It then follows the stream tumbling over boulders and small waterfalls to enter a gorge. After 5km of hard going you reach several small terraces where it is possible to camp. There is also room down by the stream. it's not the most attractive of camping spots so it may be worth pressing on to the lovely village of Shang Sumdo, about two hours away. Leave your Chukirmo ‘hotel’ by taking the path down to the river and not the one rising up a bank ahead of you. The best route among the pebbles and boulders can be hard to find, but it's usually marked by a series of small cairns. Walk in the river bed until you are almost past the neat village of Chogdo, situated up on the north (L) side of the valley. Then cross onto the left (N) bank if you have not already done so. At last there is a good trail that rises out of the river bed up to the left (N) and takes you to Shang Sumdo. About 20 minutes along this track there's a short section along the river bed again but the rest is easy going. One campsite is beautifully situated in front of the farmhouses with irrigation channels flowing around the grassy site. There is another around the corner in the entrance to the Shang River valley. The village gompa is up this valley to the north-west, some 20 minutes’ walk away. From here on there's a gravel road. it's an easy 8km along this road to the end of the trek which should take about two hours. Alternatively there is a bus from Shang Sumdo (departing 8am) to Karu, departing there for Leh at 8.30am. There's a second bus from Karu to Leh at about midday so there's no need to rush in the morning. Leave Shang Sumdo by keeping to the right (S) bank and follow the jeep track to Karu via Martselang (Marcheylang/ Merchelong; Map 11). There is an entry point to the Hemis National Park here. If it is staffed you will be asked to pay an entry fee (Rs20 per person per day within the national park, reduced to Rs1 if you are a student). Please ask how this money is being spent. Does any of it go to the villagers or to clean up the filthy campsites? To visit Hemis (p145) follow the pony track that leaves the trail to the north-west (L) just as you enter Martselang. it's about an hour from here. Alternatively you could catch the midday bus as it passes through Karu on its way up to Hemis. There is a campsite just by the monastery in Hemis and there are several simple restaurants in the village. As you enter Martselang the track swings round to the left (NW) away from the Shang River. In a few hundred metres you reach the dry stream bed over which an aqueduct passes – part of a project planned to irrigate a wide area of land on the Indus’ left bank. Follow the bed downhill to the road where you'll find a small collection of tea stalls. This is Karu and the best place to wait for the 8.30am or midday buses to Leh. Buses for Karu /Hemis leave Leh at 9.45am and 4pm daily, taking two hours. Taxis cost Rs858 (1 hour).